The health benefits of acai berry seem to be the latest in health and weight loss fads. Here are some acai berry facts to separate fact from fiction while promoting the benefits of berries in general. You have probably seen a few advertisements promoting the health benefits of acai berry. Acai berry products seem to have been promoted as a solution for various types of wellness concerns. While all berries, including the acai berry, definitely makes it to the list of the Top Foods, here are some specific acai berry facts. The acai “berry” is actually not a berry. The acai berry is more like a cherry than a berry. It has an outer skin, inside pulp and a single seed. No doubt, it got the misnomer “berry” from its small size and huge nutritional benefits like other berries. The acai berry is a native fruit of Brazil from the acai palm tree. The fruit is about 1 inch (25mm) in diameter, similar in appearance to a grape and are blackish purple or green in color, depending on the species and degree of ripening. The health benefits of acai berry seems to have gotten much attention lately and nutritional companies are selling all types of acai dietary supplements. Suddenly, acai berry supplements have wonderful claims of helping all sorts of health distresses. A few of the many claims that the acai berry is supposed to help are increased energy, improved sleep, detoxification, weight loss and lowering cholesterol levels among many others. Acai berries are currently in the nutritional spotlight and with good reason. They, like all other berries, are nutritional powerhouses. Despite the wonderful claims regarding the acai berry, the only fact backed by actual research is that it contains high levels of antioxidants. Antioxidants themselves have been linked to various health-related problems, which may give the broad range of promoted claims of acai berry some validity. 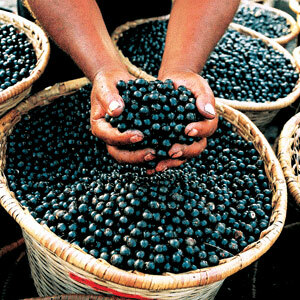 The antioxidants of this exotic fruit are makes the health benefits of acai berry famous. As with most, if not all, other fruits and vegetables, getting them fully ripened and raw provides the greatest health benefits. The acai berry is no exception. Processing them to powder or high heat destroys at least some of the antioxidants. Eating acai berries fresh and raw is preferable. If you happen to live in Brazil and can easily get fresh acai berries, do so. Eating them raw and unprocessed gives you the most health benefits. A good substitute is eating them frozen. Freezing berries is easy and you can enjoy them all year long. More processing than this and the berry will most likely lose nutrients. Actually, no matter where you live, this is good advice: Eat the locally grown, fresh, raw berries. Buy berries in bulk and freeze them. You will be getting similar health benefits and you will know what you are eating. All berries contain similar nutrients. Buying locally will ensure that you are getting quality for your money at the best prices and you will be supporting local growers. Acai berries are a powerhouse of nutrients. If you do not live where you can find these berries fresh, consider a high quality acai berry supplement. Here is my personal recommendation for an acai berry supplement: Organic Freeze Dried Acai Powder. This particular powder not only tastes delicious, but also contains a whopping 3000 ORAC units per 1/2 teaspoon! Berries, no matter what their first name may be— acai, elder, rasp, blue, straw and all other edible types of berries, are small, but nutritionally rich powerhouses. All berry varieties deserve a place among the 10 healthiest foods since they are extremely high in antioxidant and other valuable nutrients. As a dietary supplement to get a delicious, nutritional dose of antioxidants, you cannot go wrong munching a handful of berries. Start munching now with organic goji berries or the tasty chocolate goji superfood treats. Add lots of berries to your own custom made trail mixes and nutrition bars at You Bar. Use the words "well web" (no quotes) to get 5% off of your entire creation. Here are some benefits of different berry varieties. I am sure that, though this is just a partial list, it is my personal opinion that there are health benefits yet to be discovered. In addition, berries are just plain delicious! Cranberries fight urinary tract infections, help improve vascular health and may reduce the risk of getting Type 2 Diabetes. Cherries decrease inflammation and are useful in treating and preventing arthritis, fibromyalgia and lower back pain. Dark berry juices like cherry, blueberry, acai, and black current are extremely high in antioxidants. Blackberries are high in vitamins C, E, K and folic acid as well as important trace minerals like potassium, magnesium, copper and folic acid. Grape juice has all of the antioxidant heart healthy benefits of red wine. Strawberries contain calcium, magnesium, folic acid and potassium. The deep and pretty colors that characterize berries are not only naturally attractive, but they may also pack a knockout punch to cancer. The health benefits of acai berry are super, but don’t ignore berry varieties closer home. Remember that all berries are berry, berry good for you!